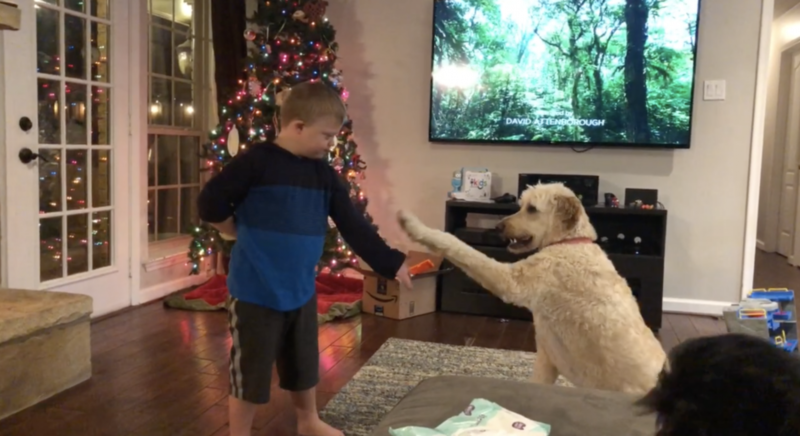 Noah’s teaching our Goldendoodle to shake! When Noah was learning how to walk he spent some time with a “Eli,” a big Golden Retriever Therapy Dog. He did really well with a big dog, and although we’ve had always had small dogs as a married couple, I thought it would be fun for Noah to have a big dog in the house. A few years I bought a Golden Doodle for our family, Jake. He’s a big dog, but, he’s also a lot of fun. Our Goldendoodle is really good with our boys, and doesn’t shed (much.) He does weigh a lot (close to 70 pounds) so even though he is good with kids, his size makes him rougher than he intends to be sometimes…but it’s all good. We’re glad to have Jake as part of our family! I pulled my phone out the other night and captured some video of Noah playing / training our Golden Doodle. There are a lot of things I really love about this video! The first is Noah’s speech. 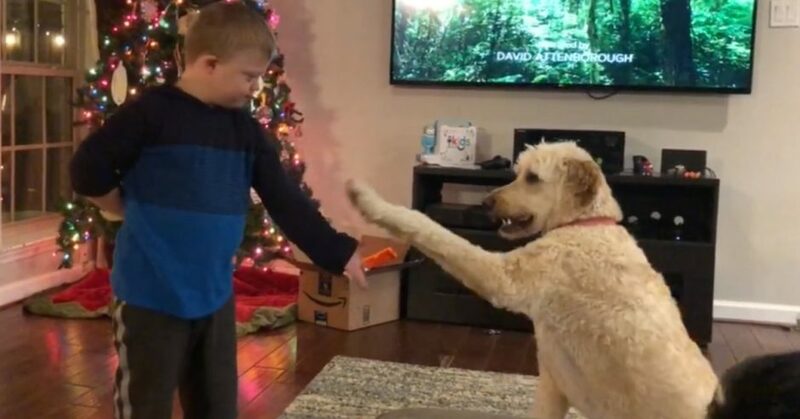 I love how clear you can hear Noah say the words, “that one,” “shake” “down” and my favorite…”daddy.” The second is how well Noah does with the dog; Jake understands what Noah is asking him to do (for the most part) and Jake obeys (for the most part!) It’s great. It’s fun watching Noah and Jake interact…and isn’t Noah’s speech coming along nicely!? Do you have pets in your house? If so what kind? Leave a comment and let us know. This is beautiful and thank you for sharing, I enjoy reading your posts.